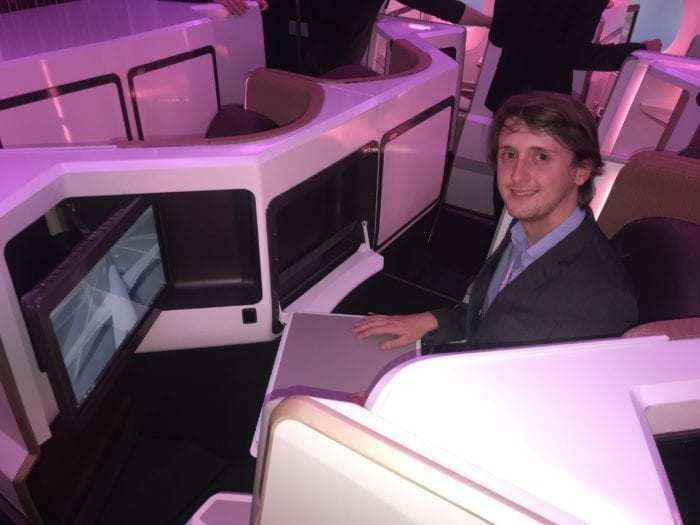 Yesterday Simple Flying had the pleasure of attending Virgin Atlantic’s Airbus A350 launch in Crawley, near London Gatwick. 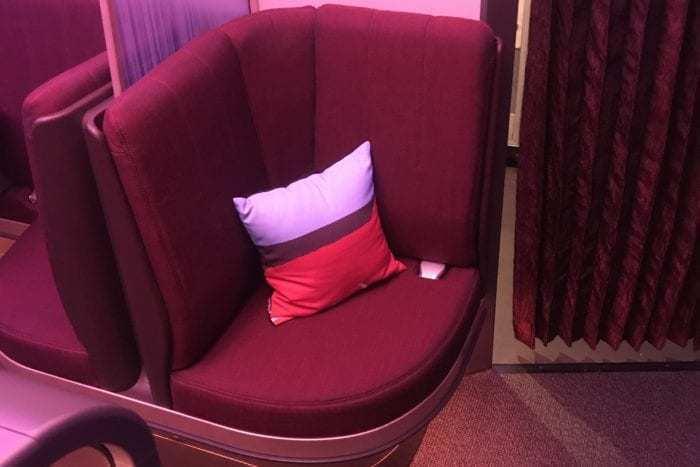 While the star of the show was undoubtedly the new Upper Class seat, so much more was also announced. 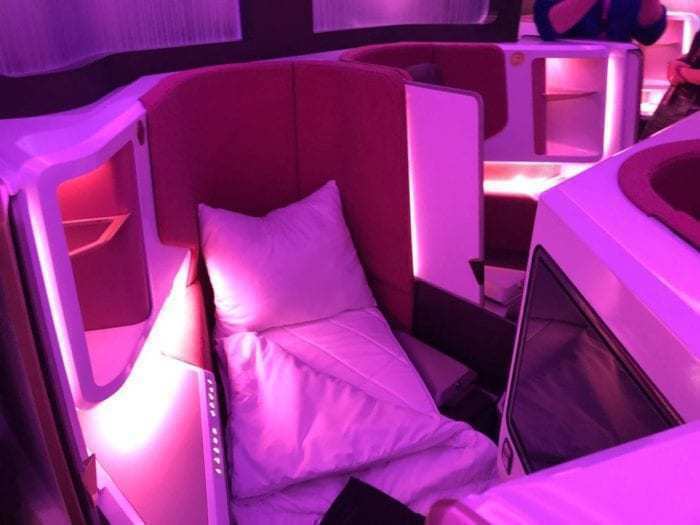 From business suites to economy seats, the entire Virgin Atlantic cabin has undergone a makeover, especially for this new aircraft. While the aircraft won’t get an all-new livery, it will differ from the current Virgin Atlantic livery in that the iconic Varga Girl icon will be replaced by new icons representing the diversity of Great Britain. Simple Flying took a look inside the new aircraft from front to back. Passengers will typically board the aircraft at door two, the location of “The Loft”. Turning left upon boarding takes passengers into the Upper Class cabin. 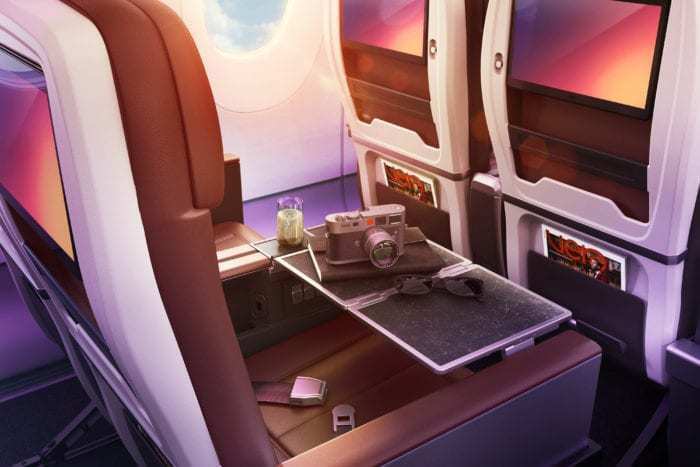 The Upper Class cabin is Virgin’s business class cabin and, exclusively for the A350 for the time being, this cabin boasts a brand new suite seat. The new suite sees every passenger given direct aisle access from a 20-inch wide seat which faces forward and towards the window. Unfortunately, the seats do not have complete privacy. While this is great for couples travelling together, it is not so great for the passengers that want to get away from it all. The seats each have an 18.5-inch touch screen in-flight entertainment screen. Additionally, each suite has individual mood lighting, while the chair will transform into an 82-inch bed at the touch of a button. The Upper Class cabin has 44 seats; 11 rows of four seats in a 1-2-1 configuration. Just behind the Upper Class cabin is an area called The Loft. The Loft is where most passengers will board the aircraft, and it serves as a bar for the Upper Class passengers during flight. Designed for eight people, the new area is entirely unlike the airline’s previous bar. Indeed, it comes across as more of a lounge than a bar. There are five seats with seatbelts so that passengers don’t have to leave the area during turbulence. On the wall is a large 32-inch touch screen. Virgin is still deciding what to play on this screen, however, early thoughts from the airline include drone footage and live events. Looking up, there is a gold plated ‘chandelier’ overhead, while the area is separated from the main cabin by translucent plastic. The actual bar is now hidden away in the galley to make more space for the passengers using the area. 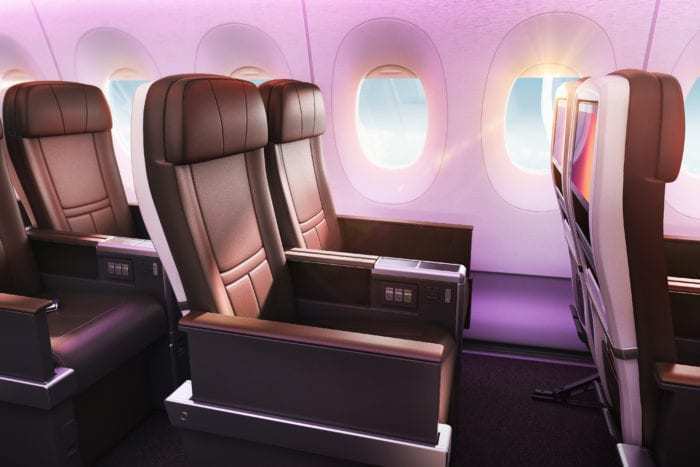 The next cabin on Virgin’s A350-1000s is the premium economy cabin. 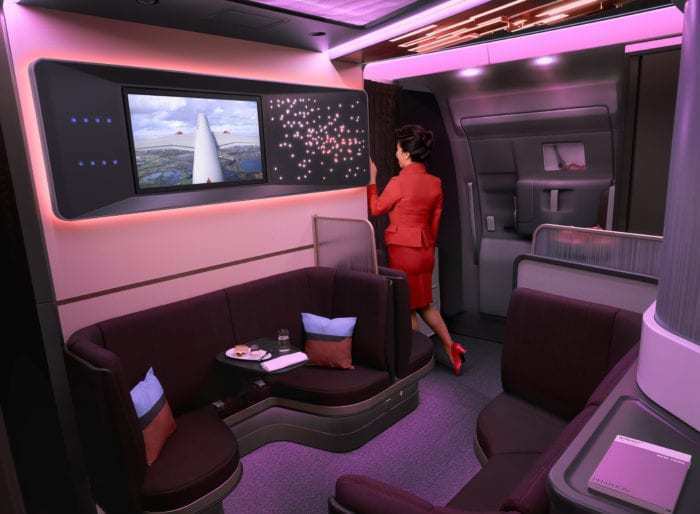 This cabin will seat slightly more than Upper Class with 56 seats. These will be seven rows of a somewhat cramped 2-4-2 configuration. At 18.5 inches wide, the seats are slightly narrower than the current premium economy seats. The seats each recline by seven inches, and have a pitch of 38 inches. The front row seats will each have an additional feature: a pop out leg rest. However, the other rows will not. All of the premium economy tables are stowed in the side of the chair and are equipped with textured faux slate patterns. While the front row will have 11.6-inch in-flight entertainment screens, the remainder of the seats will have 13.3-inch displays. The last cabin on the aircraft is the economy cabin. This is where the majority of Virgin’s A350 passengers will sit in its 235 seats. In a 3-3-3 configuration, there are 25 full rows. Row 53 is 2-3-2, while row 71 is 0-3-0. 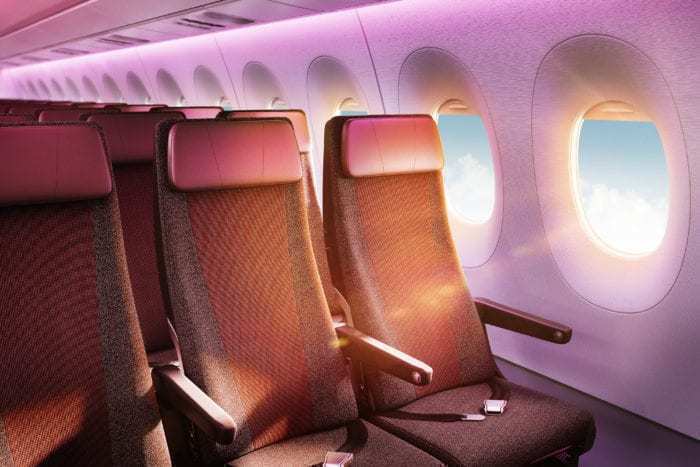 There will be two types of seats in this cabin: the ‘delight seats’ offer extra legroom, while the ‘classic and light’ seats have standard legroom. The ‘classic and light’ seat pitch is set to be 31-inches, while the ‘delight’ seat pitch is 34-inches. Additionally, the seats are up to 17.4-inches wide with a five inch recline. The in-flight entertainment screens in economy are 11.6-inches, except for the front row where they are 10.1-inches. All of the A350’s seats have two USB power sockets and, apart from the economy cabin, all seats have an AC power socket. What do you think of the new cabin? Where would you sit? Let us know in the comments down below! 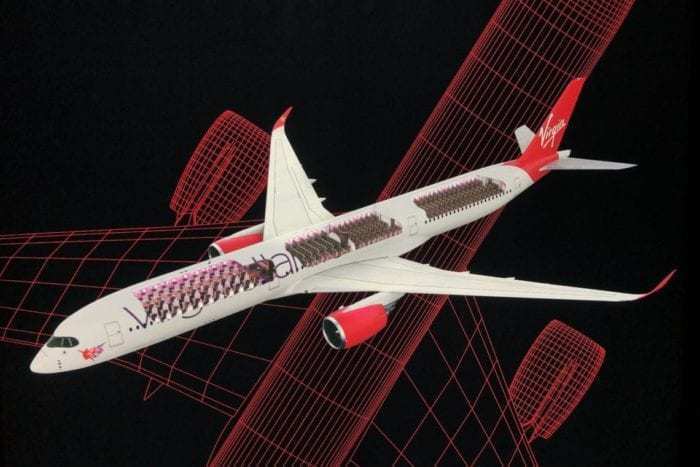 Virgin is certainly a forerunner with this breaking new kind of cabin configuration ratio. They are at an early stage anticipating on the (forced) shift airlines have to make in the next years following the change in market demand. an aircraft type with the same class ratio’s accommodating a 50 or 100 passengers less might fit future seat demand more. Especially in a more point to point orientated market.